Are you considering a professional water filter, but you don’t want to bother with installation work or calling a plumber? We have good news for you: Our wide range of easy installation filters can be set up in a minute without any hassle! Luckily, not all types of water filters require serious plumbing skills or complex installation techniques. For those who prefer the smooth and easy way to get things done around the house, the perfect choice would be to buy an easy-to-install water filter. In this article, we are going to discuss the benefits of having a zero-installation filter. Let’s see the most significant advantages of these water filters! Why Should You Get an Easy-to-Install Water Filter? As we have mentioned there are several reasons why it’s worth having a water filter that is easy to install. Zero installation filters have the amazing benefit of portability, which means you can filter water anywhere you go. When a water filter comes with the advantage of portability that can be a huge benefit on so many levels. Just imagine getting home from the store with your brand new water filter and having it ready to function without making any major changes in your home. That means that you will be able to place your water filter anywhere you would like, without dealing with the pressure of moving anything in your home. Also, if you are about to move out from your current home, taking your portable water filter with you to your next home will be the easiest thing ever! Many of the water filters you will find on the market are simply not feasible. In case you are renting a place and you move a lot, choosing a traditional water filter would simply not work for you. A zero-installation water filter, on the other hand, could make it possible for you to keep your leisure lifestyle and continue drinking pure filtered water without buying your own place or being forced to stay at your current rental. Without any doubt, the best thing about easy-to-install water filters is that they don’t require professional plumbing skills to set them up and have them filtering water for you day in and day out. Since no major plumbing work is involved, you can save some cash on calling an expensive plumber. Based on the instructions supplied by the manufacturing company you will be able to assemble or install your own water filter system. Simple installation filters are easy to install because of their simple design and simple set-up system. They come with fewer components, they are cheaper to produce for the manufacturer company, so their price can be lower too. Depending on their type, you will find some expensive models as well, but for the most part they’re more affordable than multi-stage plumbed-in home filter systems. Thanks to the portability and easy installation method of these water filters, you can take them anywhere with you and get set them up quickly and easily to provide pure filtered water! You can take them on vacation with you or to a camping trip, you can use them off-grid or in any emergency situations. Standalone water filters can be moved easily and kept anywhere comfortably in your home. These easy installation water filters are stand-alone units since they are not plumbed in your main water line, so they function without any reliance on incoming water pressure and they have no direct connection with your main water line. Gravity water filter systems feature a double chamber construction, they have one chamber installed on top of another. The upper chamber holds the filter cartridges (usually two, but there can be more), this is the chamber for unfiltered water, which the seeps through the filter elements into the lower chamber. The entire filtration process is very straightforward: Pour unfiltered water into the upper chamber, wait until it trickles down through the cartridges into the lower chamber. When ready, use the tap on the side and enjoy a glass of refreshing filtered water. Regarding the filtration capabilities, gravity water filters are able to remove pathogens, parasites, bacteria, viruses, cysts, heavy metals, fluoride, pesticides, herbicides and a wide range of other contaminants as well. They’re an all-natural way to filter water and they don’t add anything to the water or change its palatability in any way. Most gravity filter cartridges feature ceramic filter media and activated carbon. During your research on water filters you will find reverse osmosis water purification systems mentioned as “RO” water system. 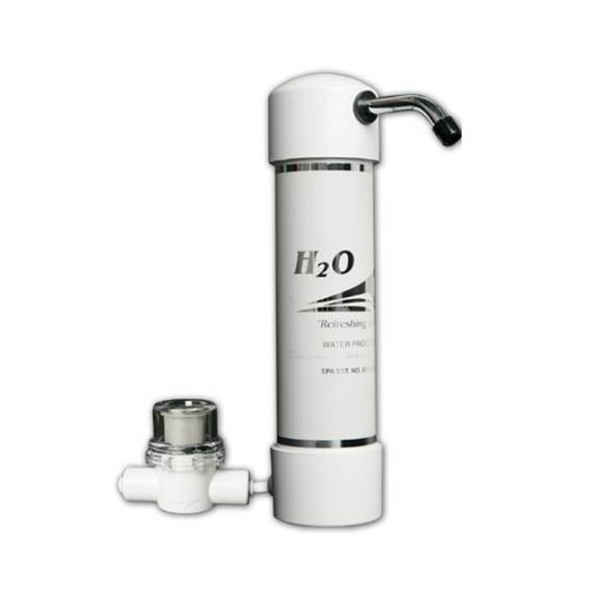 These water purification systems are known as the most advanced water treatment systems available on the market. The process of filtration in this case is based on a semi-permeable membrane. The water is being pushed through this membrane, which functions as a filter and it blocks any particles larger than water molecules. With this filtration process you can filter out chlorine, chlorides, perchlorate, fluoride, sulfates, industrial chemicals, heavy metals and many more contaminants. 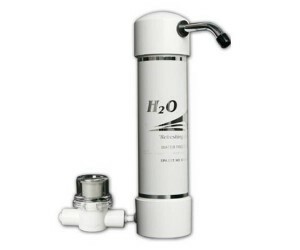 Reverse osmosis systems are also known for being the only certified water filter systems to remove arsenic from water. They are not just reliable, but also easy to set-up filters. The only disadvantage is that they need electricity in order to operate, so you won’t be able to use them off-grid, take them hiking or camping. Countertop water filters are usually mentioned as no-installation or zero installation water filter systems since they are without any doubt the easiest water filters to install and use. The process of setting up these filters is simply based on one single step: attach the tube of the filter to your kitchen tap and it’s ready to use. As we have mentioned above, gravity filters are another example of easy to install water filters, since they are not connected to your main water supply. The installation is just as simple as the process of filtration: pour unfiltered water in the upper chamber and enjoy your pure filtered water using the tap attached to the side of the lower chamber. The fact that you are able to carry your own water filter from one place to another is just amazing! Moving out from your current rental to another, hiking, camping or living off-grid won’t be a problem anymore, since these innovative water filter devices will always make sure that you have pure refreshing filtered water whenever, wherever. Fridge water filters will make sure that the water dispensed by your refrigerator or from your fridge is clean and healthy to consume. The maintenance of these water filter devices is free of any hassle, you just have to twist them on/off or pull them out/push them into the designated area of your fridge or refrigerator. 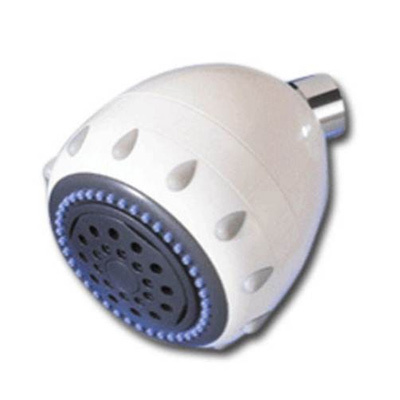 Shower filters are easy to set-up filter systems, usually they can simply fit on any regular showerhead. Being designed with the advantage of portability, shower filters are easy to carry on trips and simple to use in any hotels or vacation homes. Water filter bottles are mini-filtration devices fitted into water bottles, offering filtration on the go both for urban travellers and traveller to remote areas, depending on the type of filter you get. Some filter bottles have a hand-pumping system to create pressure to push water through a filter media for filtration, others filter water as you pour into the bottle. Let’s wrap up the things we discussed about easy-to-install water filters and see the main reasons why you should choose them over plumbed-in water filter systems. First of all, the fact that they are easier to set-up and use does not mean that they are less efficient. These water filters are just as professional and reliable as other built-in filter systems. They are affordable, sometimes even cheaper since they have less components. Feasibility and portability are other huge advantages that these filters can offer you, so you won’t have to worry about moving to another place or missing your water filter during vacation season. Save money, time and energy by purchasing a water filter that is easy to install. Delete the number of that expensive plumber, it’s time for you to handle your own water filter system from now on.